Eyelash extensions allow you to get the long-lashed look you’ve always wanted, but the process of taking your lash extensions off can be tricky and almost make you re-think using them. Almost. Don’t worry, we’ve got your back. Read on to discover the best way to remove your eyelash extensions. 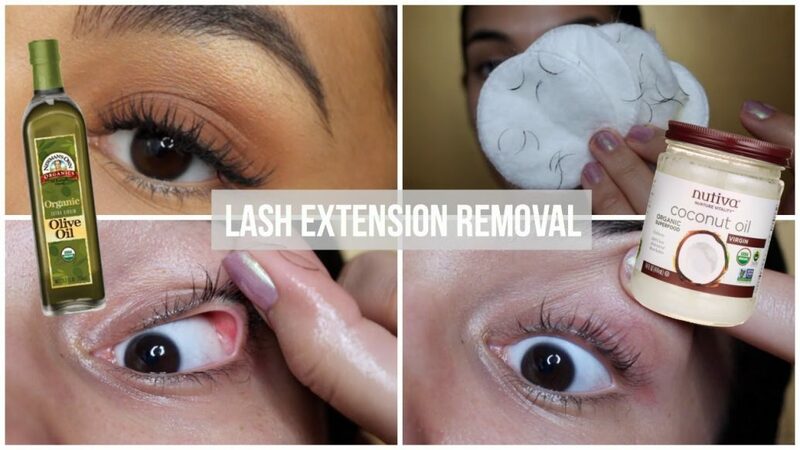 Yes, there is such a thing as professional grade eyelash extension remover. Good news, right? There are a few eyelash extension removal gel products on the market but the two that have received the best reviews are Blink Gel Remover and Eyelash Extension Alluring Glue Remover Gel. Both can be purchased on Amazon. To use these professional grade removing gels, you place the gel at the base of your eyelashes, where the glue of the false lashes was adhered to your natural lashes. Leave the gel on for about three to five minutes and voila. Your extensions should slide right off. Wipe off any excess glue from your lashes with a warm washcloth. Remember it’s important to avoid the gel coming into contact with your eyes. So take it slow and remove the extensions one eye at a time or get a friend to help! If you prefer to use natural, organic products natural oils are going to be your friend to help you remove your eyelash extensions. There are numerous oils available at your favorite natural store, but for this job the best oils to use are either olive oil or coconut oil. Use a cotton ball dipped in olive or coconut oil, try a Q-tip for a more precise application, and wipe the oil along where the extension glue is adhered to your lashes. To ease the removal process you may want to soak a cotton pad in the oil of your choice and hold the moistened pad to your lashes for a few minutes and then you should be able to slide your extensions off easily. After having removed your extensions take a warm washcloth and wipe off any excess oil from your eye area to avoid contact with your eyes. Watch this Youtube video to learn which oil works best and for some extra tips and tricks to try when using oil to remove your eyelash extensions. If you’re in a bind and need to remove your lash extensions right this very minute, but don’t have any lash remover gel or oils at your disposable you still might have something in your make-up bag that can help. If you wear make-up, you most likely have some type of make-up remover. For the most part, liquid remover works best, but remover pads might work, especially if your lashes have been on for a while. This process uses the same steps as if you were to use olive or coconut oil to remove your extensions. Take a cotton ball, pad. or Q-tip and thoroughly soak it with your remover, this will work the best if your make-up remover is oil based. Make sure the excess isn’t dripping as you also don’t want to get remover in your eyes. Place the pad with remover against the glue of your extensions and hold. You may have to moisten your lashes for longer than when using the oil, so hold in place for about five minutes and maybe even longer if your lashes are relatively new. Gently wipe the glue off your lashes and your extensions should slide easily off and without damaging your natural lashes. If you’ve removed your eyelash extensions and notice a few stragglers left behind, steam is going to be your best friend. You may have already used one of the tactics above to remove your eyelashes, but still some lashes are hanging on. By using steam you’ll be able to gently remove the remaining few lashes and you won’t have to use any more special products. First, clean your face and remove all your make-up. This ensures you’ll be able to clearly see where the extensions adhere to your natural lashes. This will allow you to know where and what to coax, and not accidentally pull your natural lashes. Next, boil some water. Make sure it gets to a roiling boil and then, carefully, remove it from the heat source. Again, carefully lean over the water and a place a towel over your head. This will trap the steam and direct it straight on your face. Close your eyes and let the steam work its magic. The steam will naturally loosen the last few persistent lash extensions and you should be able to gently remove them and should be able to do so without damaging your natural lashes. As a side benefit, the steam will naturally open up your pores so you’ll be getting a mini facial in the process! Remember this method will only work for older extensions that have been in place for a long time and that have previously been treated with some other method of removal, like a gel or oil. Also be careful when removing the lash extensions. As there is no gel or oil on the extension it won’t glide off as easily. You’ll need to gently coax it off. Never pull the extension off. Not only will this be painful, but you’ll also most likely damage and pull off some of your natural lashes, and remember it can take months for new lashes to grow! If you don’t feel confident using any of these do it yourself methods to remove your eyelash extensions then you might need to head back to the salon and have a specialist remove your extensions. The good news is that many salons offer free eyelash extension removal! To find a salon that offers this service for free we recommend contacting the salon where you had your eyelash extensions put on. If not, try calling around to other salons and you might luck out and find a salon close to you that offers this service. If you can’t find a salon that will do it for free, try calling around to different salons to find out the range of prices you might expect to pay if you decide to go this route and your salon doesn’t perform this service or you did your lashes yourself. Visiting a salon and having a professional remove your eyelash extensions is probably the safest and easiest method to remove your eyelashes. An extension specialist is trained to remove your extensions with a minimal amount of pain and with the least chance of damage to your natural lashes. Regardless of which eyelash extension removal method you choose after removing your extensions your eyelashes deserve some extra TLC. Not only was the removal process somewhat harsh for your natural lashes, your lashes have been crowded by your extensions for an extended period of time. After removing your extensions it’s a good time to condition and refresh your natural lashes. Use an eyelash conditioning product to give your lashes that extra bit of care. Use a conditioner that is rich in natural vitamins and utilizes essential oils that will really penetrate and condition your lashes.